DPMMR was recently featured in The University of Miami’s publication News @ The U for hosting a graduate course for RSMAS – UM’s Rosenstiel School’s Department of Marine Ecosystems & Society. The unique course is taught by Nancy Cooper, President and Director of Training here at DPMMR and focuses on dolphin rehabilitation and research. The course titled “Marine Mammal Applied Behavior Analysis And Managed Care” teaches students about care, rescue, and rehabilitation of dolphins, whales, and manatees. Students receive hands-on experience interacting with eight resident dolphins living in our natural ocean-water lagoon. Training and swim sessions include working with hand signals to prompt the dolphins to wave their tail flukes, bow, jump out of the water, whistle, and more. Students have an entire catalog of hand signals to work with, and some of the dolphins know as many as 80 hand signals. The course also emphasizes that dolphins are sentinels for ocean health and early warning signs of what’s to come. By monitoring dolphins, we can tell when things are out of balance so that we can figure out what is going on and how to solve those issues. To read the article in its entirety visit News @ The U. 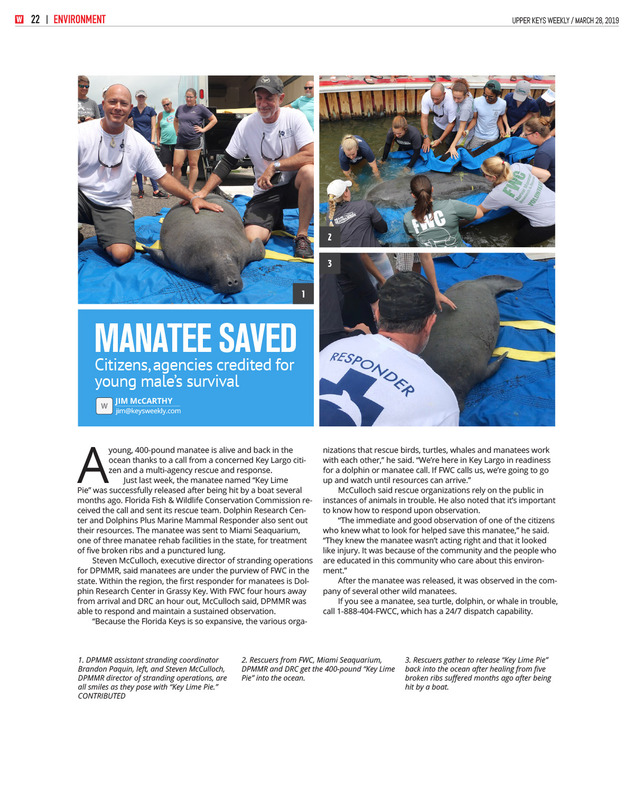 The DPMMR team was featured in the Keys Weekly for assisting in the rescue of a young, 400-pound manatee in Key Largo. Although the Dolphin Research Center in Grassy Key is the regions manatee first responder, we were able to respond immediately due to the proximity of the manatee to our location. We maintained a sustained observation of the injured manatee, which had suffered from five broken ribs and a punctured lung, after being hit by a boat. The manatee was sent to the Miami Seaquarium, one of three manatee rehab facilities in Florida for treatment and recovery. Thanks to the multi-agency response and rescue, the manatee that was named “Key Lime Pie” was successfully released into the wild, after several months of care. Steven McCulloch, executive director of standing operations for DPMMR said that manatees are under the purview of the Florida Fish & Wildlife Conservation. The FWC receives calls first, then dispatches local organizations that work hand-in-hand to save manatees, sea turtles, dolphins, and other sea mammals. At DPMMR, we are always ready to respond to injured dolphins or whales. Rescue efforts oftentimes rely on public observation and information. If you see a marine mammal in distress, please call Florida Fish & Wildlife Conservation at 888-404-FWCC. They are available 24/7 with dispatch capability around the clock. Check out coverage of this successful multi-agency rescue online at the Keys Weekly. During Sunday's Take Stock in Children Fishing Tournament, sponsored by Michael Shipley of Island Bay Resort, fishing guide Chris Jones, of Mudpuppy Charters and his guests Will Palmer and Maura Palmer, spotted an Atlantic bottlenose dolphin isolated and stuck in a shallow water filled pothole in north Florida Bay. These folks called National Park Ranger, Brandon Moore, who contacted DPMMR, the only federally licensed whale and dolphin stranding response team in the Florida Keys. An inter-agency team response with DPMMR and National Park Service including Primary Responders, Steve Mc Culloch and Brandon Paquin, with veterinarian Dr. Jillian Schwartz, along with rangers Steve Mullett from the Flamingo district, Sean Perchalski, Zach Parkes, and Russell Branch, resulted in a successful evaluation, relocation, and release of the animal. Upon release, the adult female dolphin immediately joined two bottlenose dolphins and began normal foraging behavior. Special thanks to the National Park Service and experienced local fishing guides, who knew to make the call when they saw a marine mammal in distress. To support your local whale and dolphin rescue organization, please visit https://hubs.ly/H0d-65m0. Proceeds from all guest interactions directly support this type of local conservation and research. If you see a marine mammal in distress, call FWC at 888-404-FWCC.